Federal immigration authorities said they did not circulate or issue notices posted Thursday in the Washington, DC, area asking the public to report undocumented immigrants, reports BuzzFeed. The notices, which feature the US Immigration and Customs Enforcement (ICE) logo at the top, state that it is a federal offense to harbor, encourage, or help an undocumented immigrant remain in the US. "If you see something, say something," the poster states. "If you would like to report illegal aliens, please call Immigration and Customs Enforcement." 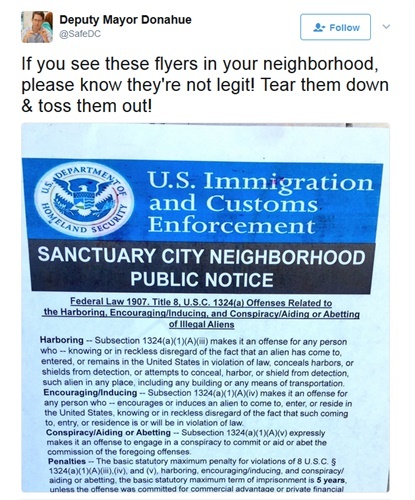 The poster, titled "Sanctuary City Neighborhood Public Notice," provides numbers to the Department of Homeland Security and Customs and Border Protection. On Twitter, DC Mayor Muriel Bowser said the signs aren’t real and has been in contact with the police department and DC Department of Public Works to have them removed.